Performers include: Scott Menville, Granville Van Dusen, Rob Paulsen, and Don Messick. An animated James Bond-like series that centers around the adventures of 11-year-old Jonny Quest (Scott Menville). Jonny’s dad is Dr. Benton Quest (Don Messick), one of the world’s top scientists. Dr. Quest is involved in areas of top secret research that takes him all over the world so the government assigns Roger “Race” Bannon (Granville Van Dusen) as the Quests’ bodyguard. Joining them are Hadji (Rob Paulsen), a young prince from India with some mystical abilities; Jessie Bradshaw (Georgi Irene), the daughter of a colleague of Dr. Quest’s; Hardrock (Dorian Harewood), a man made of living stone; and Jonny’s scrappy pet bulldog, Bandit (Don Messick). This is the second Jonny Quest series. The episodes are very similar to the original show’s that were produced in the 1960s, with the exception of the addition of Jessie and Hardrock, some different voice performers, and more “kid-friendly” storylines. The new installments are combined with the originals for syndication. 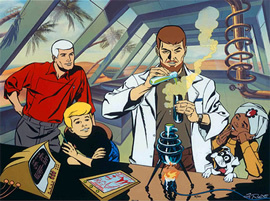 Jessie appeared in later versions of Jonny Quest but was retconned to be Race’s daughter. Hardrock was never used again.